In the majority of societies, women work longer hours than men, are usually paid less and are more likely to live in poverty. In developing countries, they maintain the household; carrying out such tasks as such as, caregiving, food preparation, carrying water and collecting fuel. This unpaid domestic work places them at the hub of home and community, but their influence on finance, policy, development, governance, at personal, local and national levels, is often neglected. 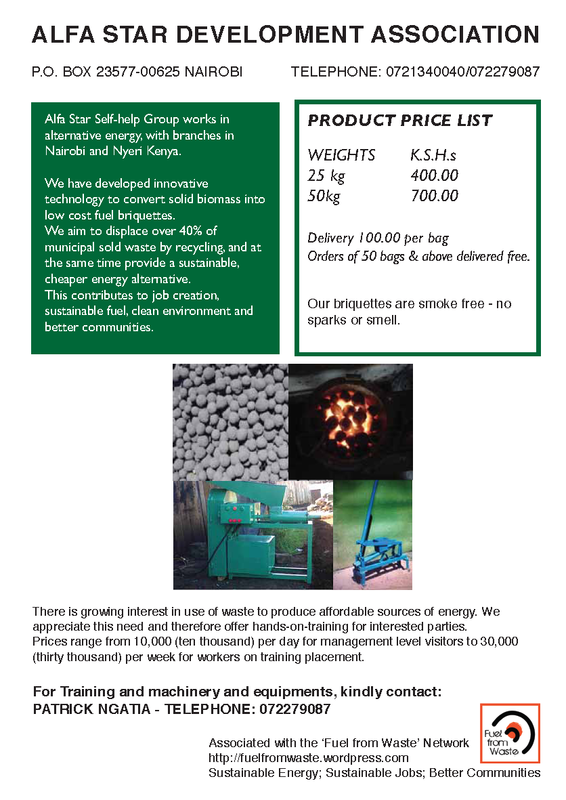 Briquetting is one activity that gives an opportunity to help remodel the scope of that influence. It can act as a gateway to extending domestic and community responsibility into generation of self-sufficiency through finance, control of community waste management, reforestation and, therefore, family and community health in their area. 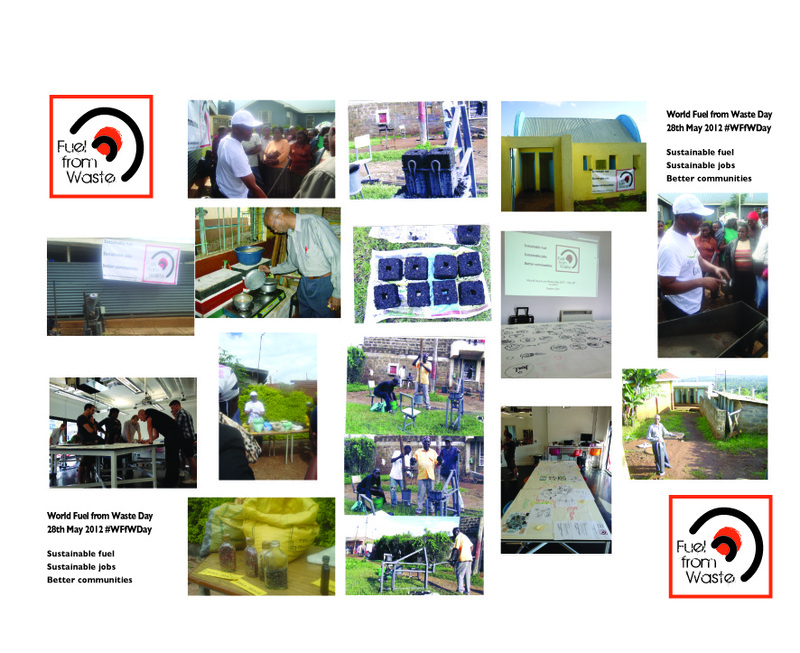 They participated – co-designing the ‘Roadmap’, exhibiting the produce and demonstrating their production – in the ‘Fuel from Waste 2011’ unConference, have done fantastic work (many trained and supported by the tireless Legacy Foundation http://www.legacyfound.org/) over many years, and are part of the ongoing FfW network and plan. Bernadette Muthoni is the force behind Upendo Briquettes in Makina in the vast Kibera Estate. For the middle-aged woman, briquettes have opened a new chapter in her life. “I used charcoal to raise my five children,” she says adding that she was an expert in the trade. “I know it [charcoal burning] like a man.” But this business had its challenges. “I used to suffer chest pains so most of the money I made used to go to the doctors,” laments Muthoni. She is proud that she not only learnt briquette making but has also made modifications to improve her products from knowledge gained from using them. “Hii ni kazi ya kichwa si ya masomo”, (this is innovative work, not necessary learnt from books), she says describing the modifications she has made on her products. She is a good marketer, we watch her explain the benefits of the briquette jiko, stove that does not produce black soot that stains the sufuria, pot used to make food. 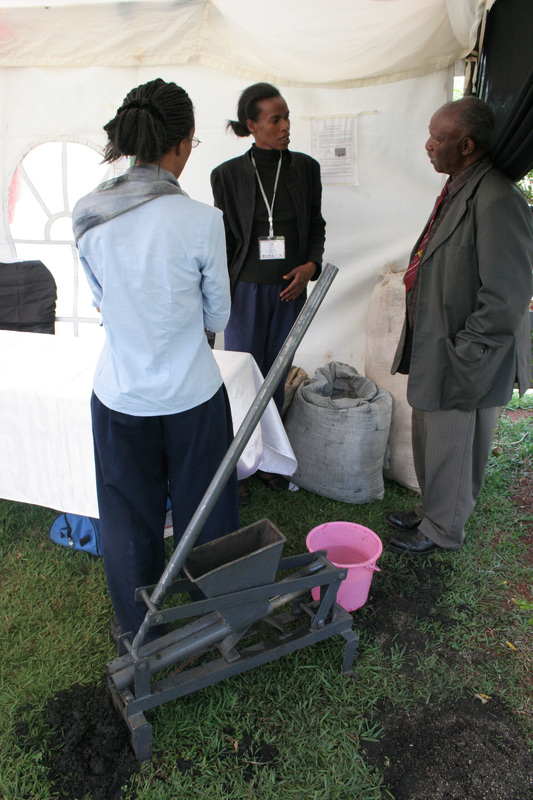 “It will only produce soot if the briquette was made using sub-standard material,” she explains to a visitor at her tent. “It’s just like gas, if there is a problem with the gas burner, it will also blacken your sufuria but if it is ok, then your sufuria will remain the same,” she adds. For her, a key advantage of using briquettes is that there is absolutely no waste, she uses the ash from her jiko as raw material for making more briquettes. 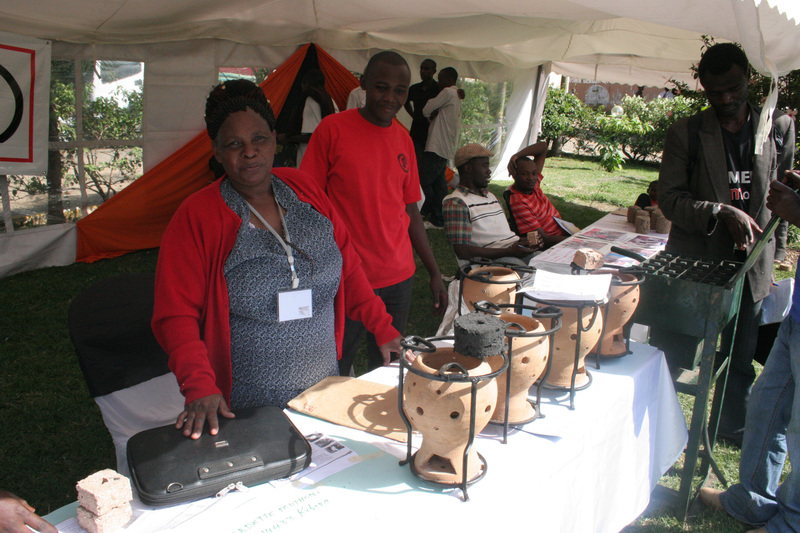 Muthoni makes stoves that are better suited for briquette using steel rods and clay. At the exhibition, she made brisk business selling the well-displayed stoves. She had two types of stoves, smaller ones going for KSh850 and a bigger design retailing at KSh1200. But she would not disclose how much she had made from the sales. 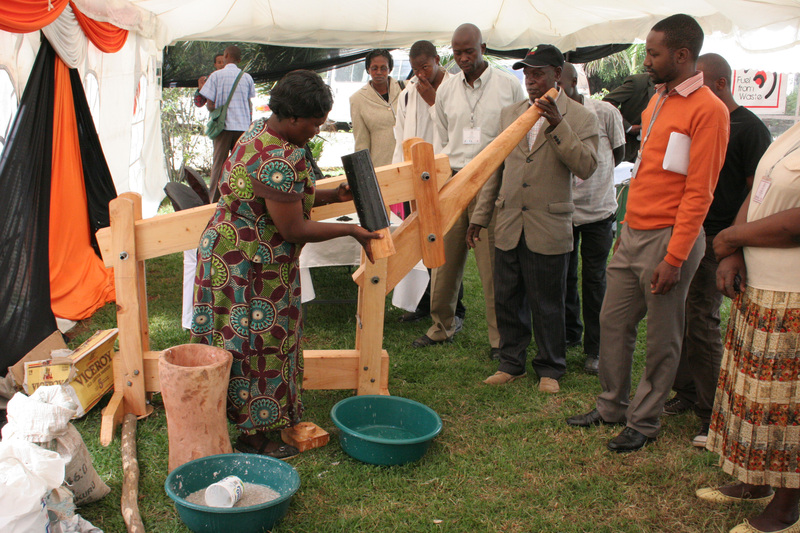 She had her briquette making machine imported from Germany at a cost of Kshs 80,000. Not one to keep the new knowledge to herself, Muthoni has attempted to train women and youth in her rural home in Nyeri in this new technology. But she is disappointed that they are not so keen on it. The three ladies belong to a chama, a club of about 30 women from their community. They learnt briquette making in the year 2000 from Eunice who was taught by women in another informal settlement in Nairobi’s industrial area. 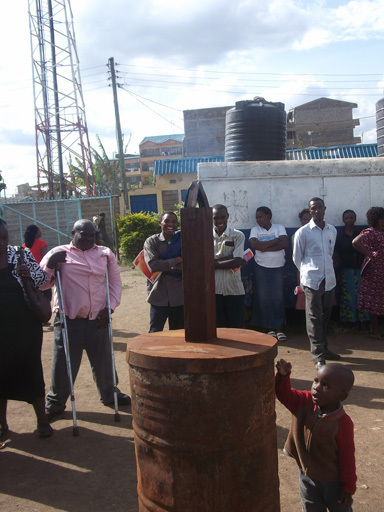 Through the groups’ merry-go-round, they contribute KSh150 per week. They raise money for their weekly contributions through the sale of woka. However, they produce the briquettes individually. 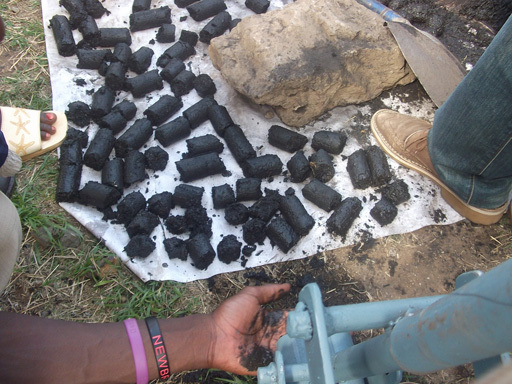 The briquettes are for domestic use but they also sell them at Ksh2 a piece and a basin for KSh100. 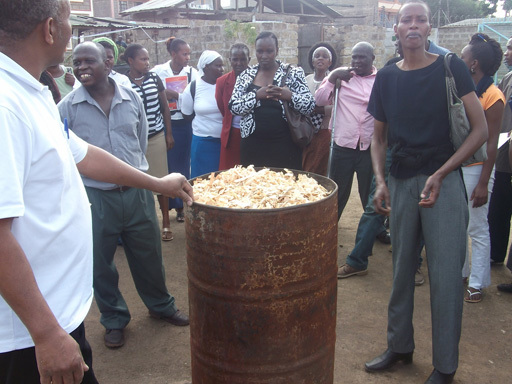 They all agree that it is cheaper to buy a basin than pieces but they cannot tell how many briquettes go into a basin. “We’ve never counted them,” perhaps indicating that their concern is more to get a cheaper alternative source of fuel than to make money out of it. 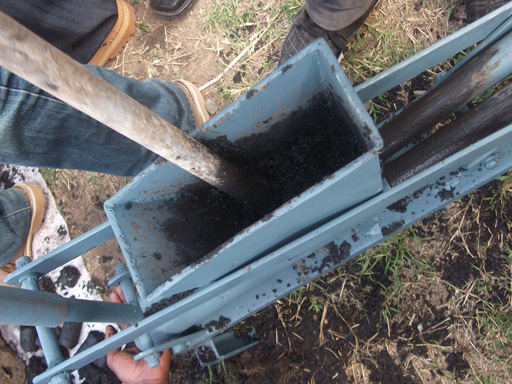 They buy charcoal dust at only KSh150 a bag and sometimes they get small pieces of charcoal in the dust that they use to ignite their briquette stoves. Sharing marks their interaction with briquettes. “It would be a waste to make a briquette fire just to make tea in the morning,” says Lillian explaining that the fire can burn for long. So what do you use to make breakfast? “Briquettes,” she answers adding that she has to plan her schedule. “You make tea, boil water for bathing the children, make lunch particularly if it is Githeri (mixture of maize and beans that boils for long), boil drinking water, then you also share the fire with a neighbor who might be needing fuel. You cannot have the fire go to waste,” she reiterates. Taphrosa has introduced briquettes in her rural home. “Nowadays, tree cutting is not allowed,” she says citing the government ban on logging. “Getting firewood or even charcoal is difficult as the products are expensive,” she adds. Through briquette making, their lives have improved, “one cannot lack food, children cannot be sent away from school for lack of fees, one can contribute to daily household expenses,” they each share the benefits of briquette making. 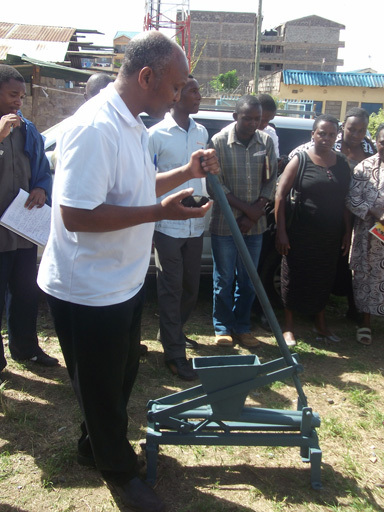 Perpetual Kamau is a poultry farmer who also makes and sells briquettes. 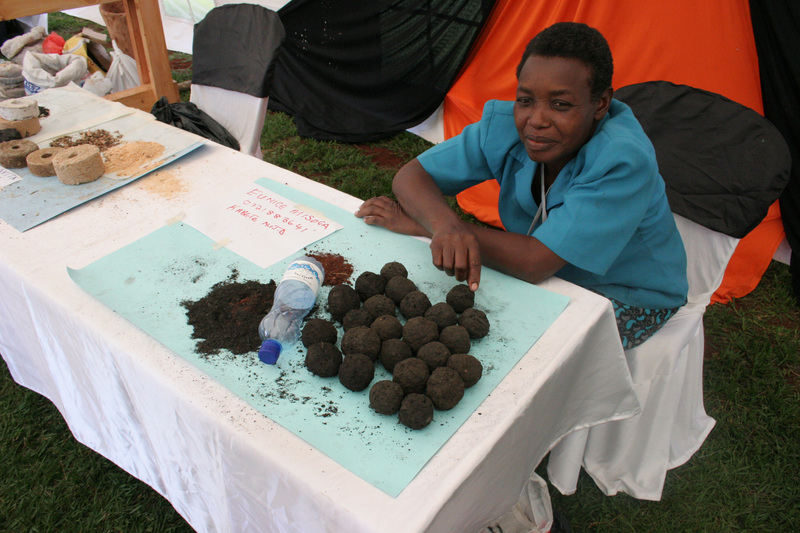 The briquettes have added value to her farming as she uses the product to keep her chicks warm. “Compared to electricity, it is so much cheaper. Just one special red bulb for keeping the brooder warm costs KSh1000.” This is before one incorporates the high cost of electricity. Now, all she has to do is light a briquette jiko and replenish the fuel supply once a day. 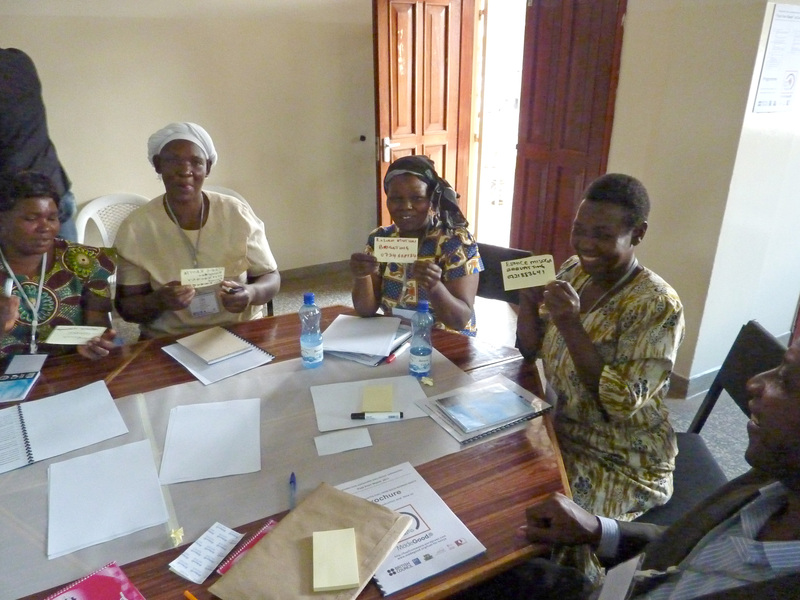 It saves her time, giving her the opportunity to share her knowledge through training women’s groups on the technology. Anthony Ondicho who visited the exhibition and recommended that this forum move out to the regions. “This is timely as we need to look for alternative and sustainable ways to generate fuel that is safe for our environment,” said the young man who was with his mother Pamela. “This should be targeted at mamas and youth. If you teach mamas and they don’t use the knowledge out there, they’ll use it in the family,” says Mrs Ondicho.